Jill Arnold at the Unnecesarean is running a special series this week entitled Defending Ourselves Against Defensive Medicine. Defensive medicine is a problem in obstetrics. Obstetricians report that they are ordering tests, planning inductions, or performing C-sections that may not be necessary, not merely in hindsight, but which have no medical indication at the time they are done. Physicians and the public at large often attribute this to a “malpractice crisis,” whereby obstetricians perform c-sections routinely to avoid malpractice litigation… One of the things that I have learned is … the belief that a high risk of malpractice litigation has caused the rise in cesarean delivery rates is empirically false. … The simple fact, however, is that cesarean rates in the United States have increased for 12 consecutive years, while malpractice litigation has remained the same or decreased. Data from the National Practitioners Data Bank reveals that obstetric malpractice suits fluctuated from 1991-2004 rather than increasing over time. This is not what one would expect if a malpractice crisis were causing the rise in cesarean rates. In addition to examining data on lawsuits, I am interviewing malpractice attorneys and birth attendants. I interviewed Jane, a malpractice defense attorney (i.e. represents physicians) who has practiced for 15 years. That’s the goofiest thing I’ve heard in a while. For an article on medical malpractice she interviews a few friends who won’t even go on record with their real names? Since Roth has made no effort to ensure that the people she interviews are representative of lawyers, I can’t imagine why she expects such drivel to be taken seriously. 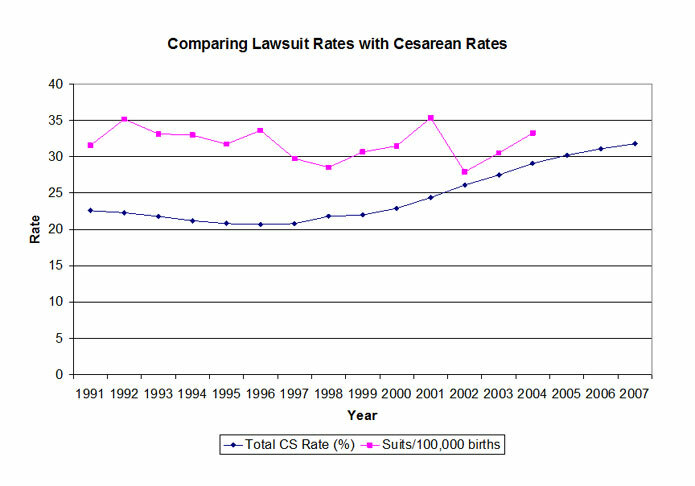 Prof. Roth thinks this demonstrates that fear of being sued is not driving the rising C-section rate. Her conclusion is wrong because it is based on assumptions that are wrong. First, she assumes that obstetricians judge the likelihood of being sued by using the number of malpractice claims filed per year as a proxy for the risk of being sued. But obstetricians don’t need to use a proxy, they know their risk of being sued. The latest data indicates that 77% of obstetricians have been sued at least once in their career. So obstetricians know that almost all obstetricians ARE sued. Second, she assumes that the deterrent effect is tied to the number of malpractice suits per year. That assumption is the equivalent of saying that bank robbers decide whether or not to rob a bank based on how many people went to jail last year for bank robbery. What keeps aspiring bank robbers from robbing the local bank is the belief that if they are caught, they will go to jail. It makes no difference to them how many individuals actually go to jail for bank robbery each year; the idea that they would reason that way is absurd. The deterrent effect of malpractice suits on obstetricians is similar to the deterrent effect of jail sentences on potential bank robbers. The fact that the likelihood of being sued is high is what drives doctors’ actions, just like the fact that the likelihood of going to jail is high is what restrains people from robbing the local bank whenever they need cash. I look at Prof. Roth’s graph and see the opposite of what she sees. The graph suggests that defensive medicine works. First of all, the graph represents an anomalous time in obstetrics. Although Prof. Roth neglects to mention it, from 1991-2003, the rate of VBAC rose dramatically and then declined dramatically; that’s the reason for the relatively flat C-section rate in those years. Over all, the C-section rate has risen steadily and dramatically since 1970. And while the rate of obstetric malpractice filings may have been flat between 1991-2004, the rate rose steeply in the prior 2 decades. In other words, since 1970 the C-section rate has risen steadily except for an anomalous period when VBACs became popular. Rates of obstetric malpractice filings rose steadily from 1970 and flattened out in the 1990’s. Looking at the data from the longer period suggests that the flattening of the malpractice filing rate may have been caused by the increased C-section rate. With respect to Amy Tuteur’s comment, the reason that the malpractice lawsuit rate stabilized and started to decline is not because of the increase in cesareans. The reason that malpractice litigation is declining is because it has become increasingly difficult for injured patients to find legal representation. Yes, that’s my point; it is increasingly difficult to find legal representation when your case is unwinnable. Malpractice litigation is done by lawyers on a contingent fee basis. That means that the client pays nothing. The lawyer pays for everything and takes one third of any financial award. It is expensive to mount these cases, but there is the potential for multimillion dollar payouts that cover all expenses and leave millions left over. Since lawyers use their own money to bring the malpractice cases, they will only take cases they believe they are likely to win; otherwise they will have wasted their entire investment in the case. 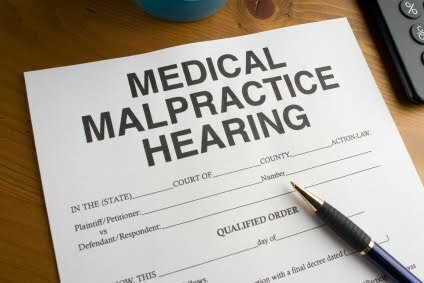 In order to win a malpractice case, the lawyer must show that outcome of the medical situation would have been different if the doctor had done something different. In the case of obstetrical malpractice that typically means that the lawyer must show that if the doctor had done a C-section, or done one sooner, the baby would have been perfectly healthy. So if an obstetrician performs a c-section at the first sign that something might be wrong, or even before anything goes wrong, any lawyer is deprived of the heart of the case. The case becomes unwinnable and no lawyer will take an unwinnable case. The entire purpose of a defensive C-section is to make sure that the case is unwinnable and therefore will never me brought. If the rate of obstetric lawsuits has stabilized because lawyers are refusing to bring lawsuits, then the dramatic rise in the C-section rate is working exactly as intended.